Fire buckets might seem like a bit of a low-tech solution to fire safety, particularly when fire extinguishers are sprinkler systems are so common. But fire buckets still have an important role to play in your company’s fire risk assessment. They are useful for tackling small blazes before they have a chance to spread. Fire buckets are small and cheap, so they can be placed strategically where fires are likely to break out. Fire buckets are useful in outdoor environments like campsites and caravan parks, where there is a high risk of fire outbreak – and where fire extinguishers would be liable to rust. They are also good at preventing fires. If you fill a fire bucket with a special ‘fire absorbent’ sand, then it can be used to cover up spilt flammable chemicals like petrol. Fire safety is a legal duty as an employer. Here are our top tips on how to make your premises safer for employees and the public with fire buckets. If your business employs five or more people, then you must keep a written record of your fire risk assessment. This will identify what you need to do to prevent fires, tackle fires and keep people safe. You need to identify fire hazards and specific risks to people. Then you need to evaluate, remove and reduce these risks. You should identify where fires can start and how they will be tackled. You also need to show that you have communicated clearly with staff. The position of firefighting equipment will need to be considered as part of your fire risk assessment. Different businesses and different premises will need different firefighting equipment to reflect the risks and needs in the immediate environment. Many businesses will want to consider purchasing or constructing a fire point. 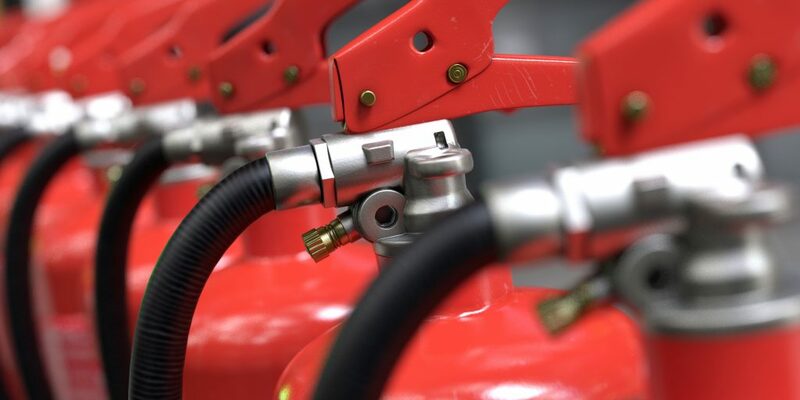 A fire point will typically be stocked with different fire extinguishers (suitable for different kinds of fire), as well as other equipment like fire buckets and a fire alarm. Fire points are often positioned on movable trolleys and placed in prominent positions so as to be useful in an emergency. Fire buckets are useful for tackling small blazes before they have chance to develop into large fires. This means that if a fire breaks out, then the fire buckets need to be in action quickly. H&O Plastics’ fire buckets are bright red and boldly emblazoned with the word ‘FIRE’ in large black letters. This helps ensure that they will not be missed in an emergency. But it is also important that you signpost where fire buckets are. You can buy fire safety regulation compliant signs online. These signs should be placed at eye level so they are easy to spot. Placing them around your fire point could help save vital seconds in an emergency. What do you fill fire buckets with? Fire buckets can be filled with different firefighting material including water, firefighting sand and special ‘absorbent’ powder. What kind of filling you use will depend on the type of fire you expect to break out. For most types of fire, coarse fire sand will do the job. If chemicals are present, special fire ‘absorbent’ powder will be more appropriate. There is often a temptation for people to use fire buckets for different purposes. Sometimes they are used as ashtrays – particularly if you have sand or fire suppressant in. Lids can help prevent this. 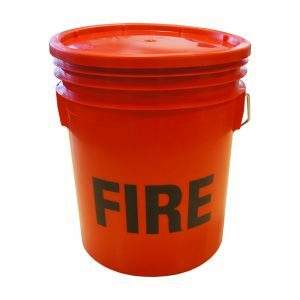 Other times a fire bucket may be the only bucket container on site – and if somebody needs a bucket they may be tempted to dump the sand or fire suppressant, wash the bucket out and use it for a different purpose. You can prevent this by communicating clearly with your staff. And consider buying some multi-use plastic buckets when you make your order from buybuckets.co.uk. Buckets are always useful for different things and you never know when you might need one.